This is an example of you combining work and righting? Very interesting – as I didn’t know any of this – except the earthquake. California’s not the only place sitting on earthquake land. Here in Alaska, at least this southern bay area, earthquakes are a pretty normal event – fortunately not the “big” one – Do look forward to the second part of this article. I suppose it’s an example of “combining.” Writing things out certainly helps me to organize my thoughts, whether it’s Buddhism or what I do for a day job. I don’t suppose, though, that some if the diction here world translate back to the day job… It’s important to me to keep this historical perspective in mind. In fact, I think we could all benefit from a little bit bigger picture in pretty much everything we do. Hopefully that does transfer back to the waterworld. It’s interesting living in different/moving to a new natural disaster zone – I grew up with earthquakes, so they’re not troublesome when they happen (as long as they’re not TOOO big of course), but the idea of tornadoes and bad hurricanes still freaks me out. Actually, the earthquake risk in the Delta is basically a scare tactic by water contractors to scare people to vote for their tunnels. There really is very little if any risk to the water supply from earthquakes. The nearest major active fault is about 60 miles away. In addition, there are no large active faults under the Delta itself. Plus the levees aren’t prone to collapse from earthquakes – none fell down during the huge 1906 or the more recent 1989 major quakes nearby. The BDCP has tried shaker tests to prove their point but the levees hold up quite well. Most levees are in reasonable shape and many have been raised/improved over the past years. Now, say an earthquake did affect some levees – not everything would fall down. Just won’t happen. Say though some islands did flood. That isn’t a significant issue for the water supply. When Jones Tract flooded in 2004 (the last island flood, by the way, 9 years ago so it’s not like things are falling apart in the Delta) – anyway, there was no salt water intrusion. No affect to pumping at all. It would be an issue for the communities in the Delta, the railroad, highways, etc. But not for the water supply. If a bunch of islands flooded during a dry period, the USGS estimates it would take 4 months or “maybe” up to 9 months until the fresh water flushed the salt water back out. Turning off the pumps for that amount of time is not a huge deal. There is plenty of water in the reservoirs to cover urban use for a year. The farmers might use too much ground water because they refuse to not keep expanding desert farms regardless. But again, not a huge issue for the state. If the islands flooded due to storm, well, that would be fresh water. No issue to the drinking water then. Besides earthquakes, you’re mixing a couple of other issues. It isn’t groundwater pumping that has led to Delta island subsidence and the subsidence isn’t as serious as stated. Some islands have subsided due to peat settling. Many have not or the farmers bring in new dirt periodically. But any subsidence isn’t caused from groundwater pumping. The Delta islands are watered from Delta water – pumped in and through the fields/orchards then pumped back out to the Delta to continue its flow. Groundwater is primarily used for some farm community drinking water and is monitored and not an issue up North. Where groundwater pumping is a problem is in the Central Valley to irrigate the desert farms there when there is a drought. They have more contracts for water than exists in the Delta, they plan to that higher-than-they-will-ever-get amount of water and then overuse the ground water when they don’t get what they “think” they should. 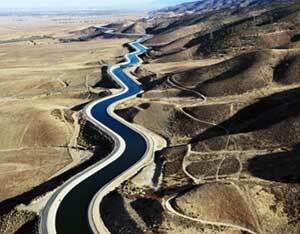 They are the ones that are at risk of collapsing the aquifers in the Central Valley. That’s a more serious issue. Thanks for the corrections about groundwater pumping and land subsidence, Jan. I guess this is an example of the extent to which earthquake “scare tactics” have worked in the Southern California water industry. I’ve been working here for a few years, and this really is the way things are presented and understood. 4-9 months (by USGS estimates, so probably double that) may not be a “huge issue for the state,” but if those months came any time outside of the Southern California “winter weather” (Dec-Mar), SoCal would be in real trouble. Our wholesaler has 6-9 months of “emergency” supply in storage – which is at 40-60% normal use. I know that y’all don’t consider SoCal’s potential water shortages a “state” problem, but Ventura County has at $1.6 billion ag industry – the sixth largest in the state, which is also the sixth largest in the country – and the county’s economic health is hit in direct proportion to whatever percentage of that farmland doesn’t get irrigated – same as anywhere. Maybe we or the powers that be or were should have figured out some other way of doing things, but they didn’t, and as of now ocean desal is not on the table as a realistic option. Hopefully it will be in a few years once this Poseidon plant in Carlsbad (http://carlsbaddesal.com/) proves feasible, but I’m as optimistic about that as you seem to be about the intentions of the BDCP. But again, thanks very much for your thoughts (and corrections). It’s good to interact with other points of view. I need it.